Today (Monday): Variable clouds to afternoon showers. Highs in the 60s. Overnight Monday Night: A few showers. Lows in the 50s. Tuesday: Cloudy with a few showers. Highs only in the 50s. Another stellar weekend is in the books. The upcoming pattern remains relatively quiet, but gets off to a cloudy – and somewhat soggy start. 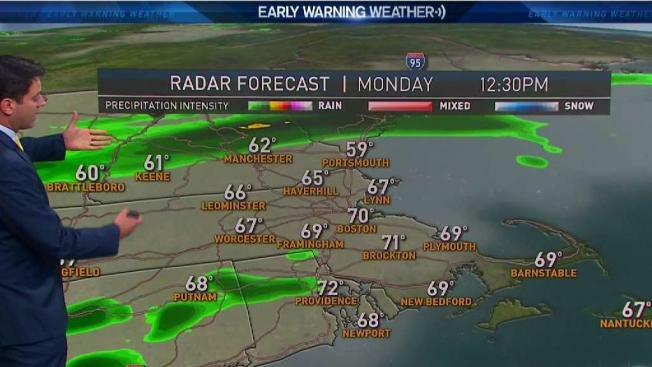 A band of showers will crawl south from Northern New England during the afternoon, cooling us off and wetting us down. It’s not even a lot of rain, but accompanied by a shift in the wind direction, it’s enough to knock us from the upper 60s to the 50s by evening. The next course of showers should move through on Tuesday, which is looking like a true October day. Highs will struggle to make 60 with a chilly northeast wind holding throughout the day. When it’s not misting, it will be showering. All of this is scheduled to move out by Wednesday as system clears and drier air moves down from the north. Sun will carry us into late week with another warming trend pushing us into the 70s on Thursday. There are signs we may not be done with the warm weather in the long term, as another huge high pressure system roots itself along the Eastern Seaboard next week.